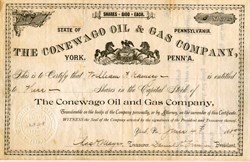 Beautiful uncancelled stock certificate from the Conewago Oil & Gas Company issued in 1889. This historic document and has an ornate border around it with a vignette the Pennsylvania coat of arms. This item has the signatures of the Company's officers. The Conewago Oil & Gas Co. purpose stated in their corporate application was �drilling, boring, digging and mining minerals. oils and gas, and preparing, transporting and selling the same.